After months of production line issues and questions about quality, Tesla has at last managed to hit a milestone with the Model 3, building 5000 examples of the electric BMW 3-series rival last week. Including the Model S and X, 7000 cars were made in that time at the company’s facility in Freemont, California, with Model 3 production helped by an unusual additional assembly line housed in a giant tent which has been described as “semi-permanent”. It’s crucial that Tesla sustains these kind of numbers to become a viable company. The firm lost cash at an alarming rate during the first quarter of 2018, and recently cut nine per cent of its workforce as it restructured in a bid to become profitable. 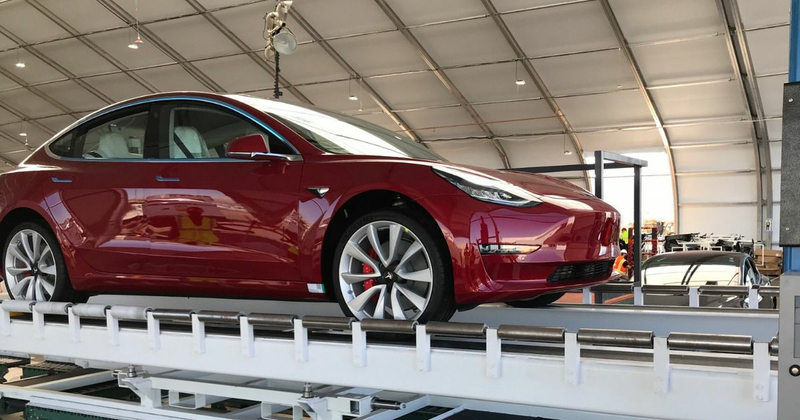 The Model 3’s production line has been hampered by a variety of setbacks including automation issues and problems with batteries. None of entry-level, $35,000 Model 3 have been built yet either, with the company focusing on higher-priced examples. With Tesla holding 450,000 reservations for the Model 3, there’s still a long way to go until the backlog is cleared, but it’s looking like the company might have finally hit its breakthrough moment.